The new A-Team figures are AWESOME! 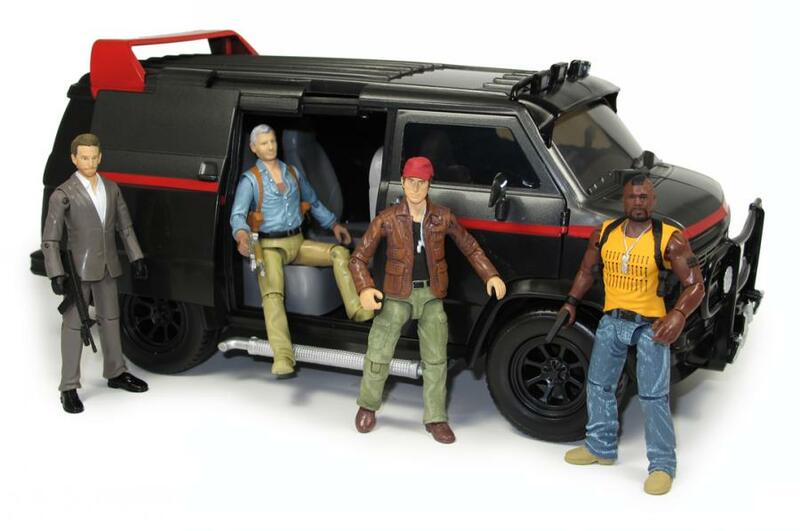 Okay, maybe it’s the rose-colored glasses of a 30-something who grew up watching the original series (and had the old Galoob figures in both scales) but I think the new A-Team figures look fantastic!! Seriously, I’ve not been this excited for a toy line in the last year! Jazwares is producing all four of “the guys” as well as the van! These bad boys will be available at both Target and TRU at the end of the month but SmallJoes.com has them up for pre-order right now. The catch? SJ isn’t ordering a whole lot beyond their pre-orders to avoid sitting on merchandise for a long time. So, if you want them, pre-order them NOW! The set of 5 (Hannibal, BA, Face, Murdock, and Lynch) will set you back $39.99 and the van is listing for $32.99. That’s pretty reasonable compared to retail! They’re listed as available 6/1/2010. Also, if you missed the DVD’s when they were released a few years back, Amazon.com has the complete series in a special van-shaped tin for $91.49! (All five seasons in one fell swoop!) Available 6/8/2010! The figures are slowly trickling into Target stores now and are scheduled to be on shelves in force by the new film’s release date of June 11, 2010.